If there was one thing you could count on Nancy Drew to do, it was to solve mysteries. Every novel, there she was, tall and blonde and glamourously eighteen, daughter of a lawyer, using her inquiring mind, sharp senses, and disregard for proper channels of authority to deduce her way through riddles, conundrums, puzzles and dilemmas. From memory, the key to cracking the case was almost always a dusty, long-forgotten dumbwaiter. The murderer either used it as a clever getaway, or threw the murder weapon into it. Of course, that required some pretty clever plot twists to get the murder to occur in a large New England mansion (particularly when it was called something like The Hawaiian Beach Party Homicide), but Carolyn Keene always found a way. Even though I wised up to Nancy Drew's winning ways fairly early on, each time I started a new novel, I'd get a few pages in and do something that would outrage, horrify and disappoint almost everyone I knew. I'd turn to the back page, and read the ending. Sometimes only the last paragraph or sentence. Sometimes, intrigued, I'd go back a bit further. Sometimes I'd find out really big spoilers, then turn back to where I was and keep reading, chewing over my illicitly-gained insight as vigorously as I chewed my nails. I'm not sure why I picked up this habit. I know I liked having the knowledge that Nancy would indeed catch the crook. I know that for me, discovering the final outcome didn't spoil my enjoyment of the narrative. There was still lots of flashlight work to be done before it was all over. It wasn't just Nancy Drew. 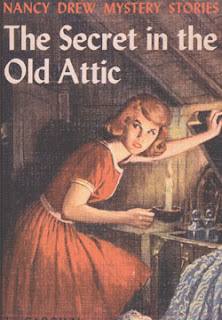 My habit of sneaking ahead spread through all Girl Detective Fiction (I was also a keen follower of Trixie Belden), as well as The Babysitter's Club and Sweet Valley High. As I grew older, I grew somewhat out of the habit of skipping to the end (my nails, sadly, remain as battered as ever). I think my teenage fascination with books about serial killers put paid to it. Skipping ahead in a chapter on Jeffrey Dahmer might, like Dahmer himself, do your head in. But even today, I don't have a passionate aversion to spoilers like many do. I see them as an occasional hazard on the busy information superhighway (that's 1995 calling; it wants its internet descriptor back). There was a massive blow-up back in April when The Age critic Jim Schembri apparently revealed a major spoiler from Scream 4 in his online review, only to change it, and claim the whole thing was a carefully constructed hoax he played on unsuspecting and selfish Twitter users. That's an extreme example. In the majority of cases, it's just general web chit chat and that almost-obsolete social networking device - In-Person Contact - that gives the game away. I've seen a number of people on social networking sites complain bitterly about being exposed to spoilers. But one could argue that these days, the bulk of the responsibility for spoiler avoidance falls on the individual. If you know the Oscars are on, and you persist in your desire to watch the delayed, 17-hour-long telecast as if it were live, then shouldn't it be up to you to avoid the internet? And possibility, seek treatment for your own masochism? Or am I just trying to justify the literary cheats of my own youth, and occasionally, present? Am I trying to "Nancy Drew" Doctor Who? Should I be promoting a better "netiquette" regarding spoilers? Should I be demanding we try harder to to shut our fat mouths online, no matter HOW awesome it was that the Doctor was hiding in the dusty, long-forgotten dumbwaiter all along? So did you just want to reassure yourself that no matter what danger she was in that she would be fine by the end? Did it remove some of the anxiety? Kids don't have a sense of tropes like we do. If the Doctor gets blown away by a spaceman in the first fifteen minutes of the series they have no reason to believe that he's not gone for good. You speak the truth. I believe the desire to avoid spoilers is in essence a quest for innocence - which explains the child-like tantrums of those who are inadvertently greeted with a spoiler. "You shouldn't have told me" etc. By all means wait to see it, but take personal responsibility to avoid your community if that's what it takes. I wish I could go back to not knowing about Santa - but I can't un-ring that bell and now have 2 kids to 'share' that with - that's my responsibility. Conversely, I wish I hadn't waited so long for carnal knowledge so YMMV. I'm with you. I also used to flick ahead in books (loved Nancy Drew and the often forgotten Trixie Belden) and I also don't care about spoilers. I love the process, not just the ending or big announcement. But some people really do get passionate about not having things 'spoiled'. I think perhaps a bit of moderation on both sides is the answer. Try not to give things away online and people who care about it should try to avoid sites like twitter and fb 'til the moment has passed. I've seen some friendships almost ended over spoilers. Seems crazy to me. I'm a firm believer in spoiler space - for a decent amount of time after a new release of X, people should take due care to preface their remarks, comments and sky writing with warnings to the delayed watchers. Were not Nancy Drew, the Hardy Boys etc ....supposed to be so predictable that one could guess what was going to happen next & then feel smug when one was right?